The Committee of the Regions Interregional Groups “Baltic Sea” and “Nord Stream 2” held their first ever meeting on 1 February 2018 in Brussels. 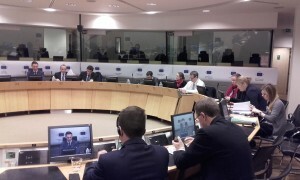 Over 15 members of the Interregional Groups attended the meeting to discuss the internal market in natural gas. The Chair of the Baltic Sea Interregional group, Pauliina Haijanen, and the Chair of the Nord Stream 2 Interregional group, Mr Olgierd Geblewicz, welcomed the first joint meeting and stressed the importance for the two groups to continue to work closely together in the future. Ms Pauliina Haijanen provided participants with an overview of the activities of the Baltic Sea Interregional Group. She presented the EU Strategy for the Baltic Sea Region as a key focus area of work for the Interregional Group. During the meeting, Mr Mauro D’Attis, Member of the Committee of the Regions, presented the working document concerning rules for the internal market in natural gas. As Rapporteur, he is currently preparing a draft opinion which will be presented and discussed at the Committee of the Regions plenary session next April. The joint meeting offered the opportunity for the Rapporteur to share his first reflections on the topic. He stressed that regional and local authorities have a key role to play regarding the question of the internal market in natural gas. There was a consensus among participants that the future opinion should highlight the importance of ensuring safety of inhabitants in every Region and diversification of the sources of gas. The CPMR Baltic Sea Commission is hosting the Secretariat of the Interregional Group “Baltic Sea”. For more information on the next meeting, please contact the Secretariat.